Learn how to empower yourself with a self-empowering mindset and heart-set. You know you need a success mindset to be successful. But what exactly is a success mindset? Maybe you are all about mindset, repeating daily affirmations, reading self-help books, watching inspiring YouTube videos, taking loads of action, and yet… not getting what you want in your business or career? Not the job you want? Not enough clients, not the right clients? Not the money you want to make? Or maybe you’re at a certain level, and you want to move to your next level but you just can’t seem to break through that inner glass ceiling? 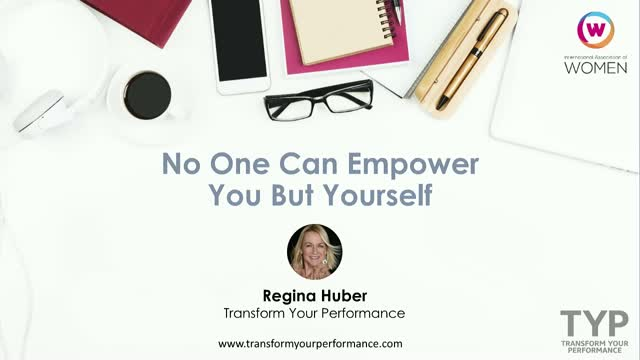 In this session, led by Regina Huber, we will explore ways to step into a self-empowering mindset and heart-set so you can not only reach for the stars but hold them in your hands, too. •What is student loan refinancing, and am I eligible? •What are the considerations surrounding the decision of whether to refinance vs. pursue loan forgiveness? •How much money do I stand to save by refinancing? •Will refinancing affect my credit? •Are there any costs or fees associated with refinancing? •How do I qualify for the 0.25% rate discount available to IAW members? Like everything in your business, networking requires awareness of your goals and objectives so that you can be purposeful and intentional about aligning your activities for success. I’ve gone from being terrified to network to creating scripts and systems that take the sting out of the fear and help me grow my professional connections and my brand. In this talk, I share my own journey; the evolutionary reasons why networking is so hard for so many people; and how you can use the winning trifecta of awareness, purpose, and intent to build a success networking practice for yourself. Your members will learn how to identify the right connections, how to evaluate the right groups, and how to leverage the investment of their time and money to get the best results. Do you ask for what you want? Or, do you simply take what you’re offered? There is magic in asking. The strongest friendships, top sales teams, and most successful businesses have one thing in common – courageous people who feel the fear and still ask for what they want. People who achieve the best results are people who know how to ask outrageously. In this presentation, Linda Swindling shares tactics and strategies which help people show up powerfully and ask for what they really want. She’ll show how to spot the other people’s negotiation (DEAL) styles in order to communicate effectively and create outrageously great outcomes. Team members and their leaders will know how to negotiate the best deals at work and in life with confidence and integrity. Make confident decisions and embrace strategic risk taking. In this webinar, you will learn 6 stages of the marathon of life, the ups and downs and how they relate to life and building a business. Life is a roller coaster and we can't control the things that happen to us, but we are in control of the how we RESPOND. The word "responsibility" means our ability to respond to life. What you BELIEVE SHAPES everything about your LIFE. With our business- I believe that it ISN’T OUR circumstances that make us UNHAPPY (we all go through hard things). It’s our ATTITUDE in our circumstances that really make us unhappy. Attitude is a LITTLE THING- that makes a BIG difference. "You are in charge of your own race"
WHEN YOU CONNECT the dots looking back at the marathon- everything was here to help you grow- same goes for life. Katie Wood is a thought leader, entrepreneur, and creator of The Jourse, a 5-week online program that helps women increase their self-awareness and kickstart their journey to a more authentic, meaningful life. - How to create a plan for your financial future, including budgeting, debt repayment, and things you should know about credit and long-term investing. Well-being is more than just living a healthy lifestyle. It is the complex combination of your physical, mental, emotional, and social health factors. Women often focus on the needs of those around them first, putting their own well-being on the back burner. This can result in a range of health issues – both physical and mental. Want to make the most out of YOUR brand, stand out from the crowd, and achieve professional success? Unearthing your personal brand allows you to grow your network, secure unique opportunities, and build your client/revenue base. Actively crafting and communicating your brand message will yield success throughout your career. Your personal brand follows you tirelessly, and it is informed by everything you post, write, photograph, pin, like, and tweet. To thrive in today’s fiercely competitive and complex environment, you can't leave your personal brand to chance. Instead, to achieve your professional goals and be on top of a decision maker’s short list, you have to make a name for yourself. Learn how to strategically take control of your message and begin to articulate your value or “wow” factor. In the world of branding, few experts possess the savvy and instinct of Stacey Cohen. A TEDx speaker and award-winning brand professional who earned her stripes on Madison Avenue and at major television networks before launching her own agency, Cohen specializes in finding, cultivating and perfecting brands. Cohen is a sought-after speaker, author and panelist in the realm of personal branding. A staple at industry conferences, Cohen is also a blogger at The Huffington Post and has been featured in Entrepreneur, Forbes, Crain’s, Sales & Marketing and a suite of other national publications. She is Founder, President and CEO of Co- Communications, a full-service marketing and communications agency.. Since 1997, Cohen has coached individuals and businesses across a range of industries — from arts and real estate to hospitality and luxury — and expertly positions their narratives in fiercely competitive markets. Stacey holds a B.S. from Syracuse University, MBA from Fordham University and recently completed a certificate program in Media, Technology and Entertainment at NYU Leonard Stern School of Business. Rachel Pedersen is the founder and CEO of the social media agency The Viral Touch, and Social Media United - teaching others how grow personal brands and retain clients. Rachel is the symbol of freedom, determination, passion for life and business; making an impact by changing lives of those around her and showing anyone and everyone that they can reach new heights they never thought possible. Rachel has helped 100’s of individuals world-wide change the trajectory of their lives by finding freedom from a 9-5 job. In just over 2 years Rachel has gone viral reaching 11.3 million, being featured in Glamour, TODAY, Cosmopolitan and US Weekly. Rachel has taken her clients from $4k months to $7k days, with a 3-22x ROAS. She has worked with Fortune 500 influencers, celebrities and clients. Don’t just be a brand builder, be a brand protector too! Learn about intellectual property and the differences between a copyright, patent, trade secret, and trademark. Learn how to utilize these legal vehicles to protect your brand and your business; and why they should be important to you and your legacy. Many women are reluctant to actively promote their value because it feels self-serving or inauthentic. Rather than promote themselves, they prefer to believe that their work will speak for itself. Unfortunately, without the confidence and commitment to share your value with others, you may lose out on important opportunities to raise your visibility, make a bigger impact and advance within your organization. -Practical, actionable strategies to help you authentically promote your value across your organization. Discover the three fundamental elements required to build a successful business you love! Learn what they don’t teach you in business school, and what skills you must master to foster your success. You will gain new tools—based in the neuroscience of performance—to match your business with your passions. Identify and remove obstacles entrepreneurs commonly face, and find the confidence to realize your business vision. •Learn three exercises and techniques based in the latest findings of neuroscience and creative psychology to drastically improve success. These will help you tap into your brain's fullest potential, increasing performance and confidence immediately. One of the most important parts of owning a business is payroll. If not done correctly, payroll can be very costly for you! In 2013 alone, the IRS issued $4.5 billion in penalties to businesses who incorrectly calculated their payroll tax. When you take into consideration the varying salaries, shift differentials, and benefit contributions, payroll can become a burden on the business owner. Even for the smallest of companies, payroll processing can be an overwhelming task. Time management for business owners. A successful crowdfunding campaign not only gives you the cash to move your business forward, it also gives you the confidence to get to the next level in your funding journey. The Webinar is designed for women considering completing their college degree or seeking an advanced degree. The pay gap is real and is increasing between college-educated workers and workers without degrees. Women out pace men when it comes to degree completion. Workers could be losing a million dollars over their lifetime without a degree. Adult students have very different needs than recent high school graduates and this webinar will address these concerns. Operation Graduate is a pathway for students considering returning to school but are reluctant. Operation Graduate helps student turn their prior college course, professional learning, and on-the-job experience into academic credit. Following this webinar, you will receive additional information from Operation Graduate about how to reduce the barrier's to graduation for you and your family. IAW has partnered with Laurel Road to provide our members with discounted interest rates on your student loans. - How do rising interest rates in the economy impact me? - Is there any way to lock in a rate now before they increase any more? - Is income driven repayment and/or loan forgiveness right for me? - How will the proposed legislative changes to federal repayment programs affect me? - What is student loan refinancing, and am I eligible? - What are the considerations surrounding the decision of whether to refinance vs. pursue loan forgiveness? This will be an interactive session with time for Q&A so please submit your questions. When Carrie Kerpen co-founded Likeable Media in 2007, the social media agency was one of the first of its kind. Six years later, when she stepped up to become CEO, times had changed. The market was crowded, the competition was fierce, and she couldn’t help but compare herself to the heads of other agencies, all of whom were pretty much the same: Loud. Extroverted. Male. In order to reinvent her company to keep up with the changing times and come out on top, Carrie had only one choice: She had to work it. What is working it? Working it is about understanding who you are, what you want, and what you bring to the table. Working it means refusing to compare yourself to others and instead focusing on your own unique super-powers. Most important, working it is the key to unlocking the biggest secret for achieving success: There is no one right way. There is only your way. This webinar is geared for those who are assessing their career options after a career break. Whether you have taken time off to stay home with young children; to care for a sick parent; or to reassess your career plans, this session will provide a road map to define your values, goals and priorities, arm yourself with information, and chart your path to the job you want. Leading Career Management Coach (CCMC) and Personal Branding Strategist, Pamela Weinberg, will help you to understand current job trends, networking strategies, resources for career research and social media job search strategies. We hear the term “innovate” constantly in discussions on strategy, product development, and operations, but what about when it comes to ourselves and our careers? In the always-changing professional environment, there is only one way to get to reach new HERizons: taking the plunge and innovating in your own career. HERizonInsights offers interactive virtual events featuring experts who provide valuable insights on the issues that matter most to professional women. Topics will cover current challenges facing women in the workplace, and the series will offer something for everyone, whether you want to develop your corporate career or launch, build, and promote your own business. Speakers will field questions during each 60-minute session, sharing insights, offering real-life examples of success, and giving practical, actionable advice and guidance.